The Israeli army accused the Syrian government on Saturday of ordering Palestinian militants in Gaza supported by Iran to fire dozens of rockets into southern Israel, and threatened to retaliate wherever it chose. The barrage of rockets, which began late Friday and continued into Saturday, triggered extensive retaliatory strikes by Israeli aircraft against Gaza that risked escalating into a wider conflict. The new flare-up came hours after six Palestinians died in renewed clashes on the Gaza-Israel border even as the territory's Islamist rulers Hamas said Egypt was seeking to negotiate a return to calm. "The rockets that were launched against Israel... we know that the orders, incentives were given from Damascus with the clear involvement of the Iranian Revolutionary Guards' Quds Force," army spokesman Lieutenant Colonel Jonathan Conricus said, referring to the Guards' foreign operations unit. At least 39 rockets have been fired at southern Israel by the Islamic Jihad group since late Friday, with 17 of them intercepted by air defences and the rest hitting open ground, the army said. Israeli aircraft carried out extensive retaliatory strikes, targeting approximately 90 sites belonging to the territory's Islamist rulers Hamas. Conricus said that Israel held Hamas responsible for the fire, even though it was carried out by Islamic Jihad at the behest of Syria and its ally Iran. "We hold Hamas responsible for everything coming from Gaza," he said. Conricus said Israel would also retaliate against the Syrian government and Iran's Quds Force, and would choose where. "Part of the address by which we will deal with this fire is also in Damascus and the Quds Force," he said. "Our response is not limited geographically." The biggest rocket barrage from Gaza in months came despite talk of progress towards an Egyptian-brokered deal to end months of often violent protests along the border in return for an easing of Israel's crippling 11-year blockade. On Sunday, Israel reopened the people and goods border crossings with Gaza and on Wednesday renewed the flow of Qatar-funded fuel to the Palestinian enclave, in an indication of its confidence that Hamas would rein in violence. The Friday border marches however drew 16,000 protesters, some of them clashing with Israeli soldiers. Five Palestinians were shot dead by Israeli fire in separate incidents along the border fence, the Gaza health ministry said. A sixth died when a hand grenade he was holding exploded accidentally, witnesses said. 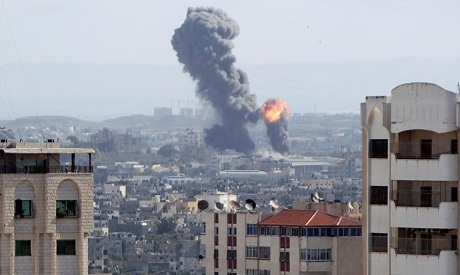 In Gaza City, a four-storey building was completely destroyed in a strike, AFP correspondents reported. The Israeli army said it was a major headquarters of Hamas. Israel launched three military offensives against Gaza since 2008, and Egypt and the United Nations have been leading diplomatic efforts to avert a fourth. The armed wing of Islamic Jihad, the second largest militant group in Gaza, threatened to continue the rocket fire on Saturday. The "resistance is considering expanding the response in number and type, if the enemy continues its aggression against our people," it said. Israel has struck Syria dozens of times in recent years, saying it is preventing Iran from supplying advanced weapons to its enemies. US President Donald Trump's peace envoy Jason Greenblatt condemned the rocket fire. "More rockets from Gaza into Israel. Another night where parents are ushering terrified children to cover. Violence will not build futures for anyone," he said on Twitter. Palestinians have gathered for protests along the border at least weekly since March 30. At least 213 Palestinians have been killed by Israeli fire in Gaza since the protests began, according to figures collated by AFP. The majority have died during protests, while smaller numbers have been killed by air strikes or tank fire. One Israeli soldier was shot dead by a Palestinian sniper over the same period. The protesters are calling to be allowed to return to lands their families fled or were expelled from in the 1948 war that accompanied Israel's creation. They are also protesting over Israel's crippling blockade. Reports Friday suggested a deal had been reached that would see the protests end in exchange for an easing of the blockade. Hamas officials denied any had been reached but confirmed to AFP that progress was being made. Israel says its blockade is necessary to isolate Hamas, while critics say it amounts to collective punishment of Gaza's two million residents.